I've been getting leading in the first 1.5" of my barrel here's my load : win case, zero 185swchp, oal 1.122", .470" crimp,wlp, and 3.8gr titegroup. My pistol is an AMT Hardballer with a Kart barrel and fitted NM bushing and I keep that barrel clean. I get about 30-50 shots and it leads up. My thoughts are not enough pressure to obturate bullet. I just switched from Bullseye at 3.8grs to Titegroup at 3.8grs do any of you shooters use this powder. I think both of these powders can be sooty. I went to .470" crimp thinking I was swaging the bullet at .468",maybe I'm wrong with that idea. Case thickness .010" and .452" bullet. Pressure has nothing to do with leading with BE velocities. I shoot 3.3gr BE and get ZERO leading. I'm re-barreling a 45 now that had minor annular rings in bore from a squib load. Gases are passing base and leading the life out of it. Inspect your barrel closely in strong light for imperfections. Also if the Kart barrel was not finish reamed it is common to lead the bore. What Jon said. But if your also not getting the groups you like then you might want to consider a little more crimp. It's a lead bullet. If you can't see/feel the crimp your probably not doing it enough. I must admit that this is a hotly debated subject and some will say that your crimp is great. Others (like me) will say that you need to crimp more. It wouldn't hurt to try it. Len, I went from .468 to .470 thinking I was squeezing the bullet and allowing gases to go around the bullet. I can go back to .468. My .470 doesn't get as visible as yours so maybe go back to .468. Does a tighter crimp deform the bullet like I'm thinking it does. I use a dillon 550b press and their dies, they should be okay. The lighter the powder charge the more crimp you need. Builds up the pressure and improves the groups. Crimp only affects shoulder of bullet. 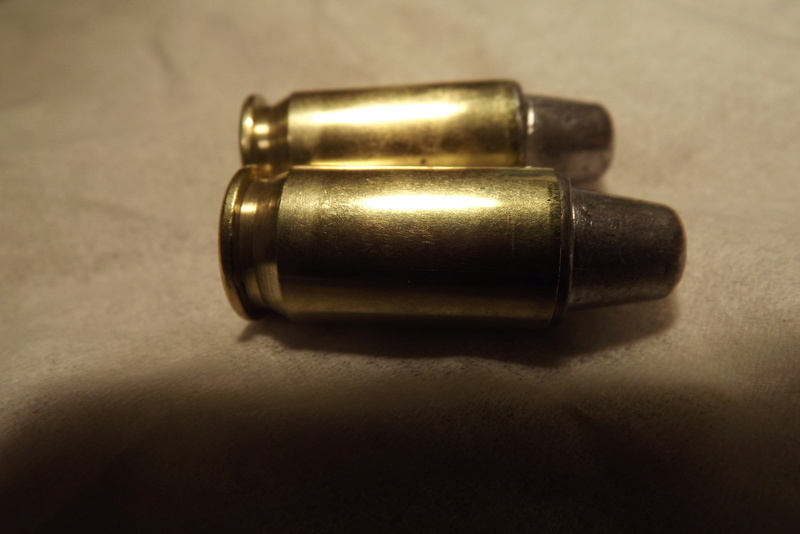 When bullet is pushed out of case when fired the case expands and crimp is no longer touching bullet. Also if you seat bullets out too far they can cause lead ring in chamber and leading. I only have shoulder sticking out .02-.03". I don't measure OAL. Drop a loaded round into barrel and make sure rim of case is flush or below barrel hood. Jon, I do keep the shoulder at about .025", but I think you and Len have me rethinking on my crimps. The barrel looks mirror smooth with .4515" etched on it's side by the link. You guys have really helping me, thank you. Did you have the same leading when you were using Bullseye? I've heard people say that Titegroup burns hot and may cause leading, I have no proof of this tough. ps - I've settled on a .468" crimp - not sure why.